New research from the University of Southampton could lead to enhanced MRI scans, producing brighter and more precise images, and potentially allowing the detection of cancerous cells before they cause health problems. 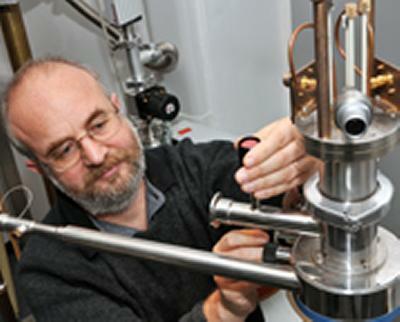 Professor Malcolm Levitt of the University of Southampton, and co-workers, have been awarded a grant from the European Research Council of 2.8 million euros to support research into enhanced nuclear magnetic resonance (NMR). NMR is the physical principle underlying MRI scanning, which is used routinely to detect abnormalities such as tumours. The long term aim is that this research will lead to a range of clinical applications, including the early detection of cancer. NMR signals are inherently very weak. However, methods have been developed recently which lead to substances exhibiting a phenomenon called hyperpolarization, and which give rise to NMR signals that can be more than 100,000 times stronger than normal. The problem is that this incredible enhancement only lasts a short amount of time - up to one minute in favourable cases. Research in Southampton has previously demonstrated the existence of quantum states that have very long lifetimes - up to half an hour in the case of the common substance nitrous oxide, often known as laughing gas. The new research grant has been awarded for a project that involves a combination of the hyperpolarization effect with the long-lived quantum states developed in Southampton. The combination could give the best of both worlds - enormously enhanced NMR signals, which last long enough to perform an MRI scan. Professor Levitt says: “This could have benefits for MRI Scanning. If you have strong signals, you can detect smaller amounts of substance that are less concentrated. For example, some substances naturally occur in a cell as part of the metabolism process, but occur in greater amounts in cancerous cells. Through this method, we should be able to detect when these substances are present and cells are potentially cancerous, earlier than ever before. In addition to funding the research, the grant will allow for two new pieces of equipment to be installed at the University of Southampton. One will be a polarizer, which will be designed and constructed in Southampton, and which will generate substances exhibiting the hyperpolarization phenomenon. The second piece of equipment will be a NMR spectrometer equipped to perform small-scale MRI experiments, to test out the new concepts in preparation for performing experiments on a clinical MRI scanner. It is hoped that this research, which will run over the next four years, will lead to the development of new tools for clinicians to detect metabolic or anatomical abnormalities in the body.